'Snowbrook' (Keith Keppel, R. 1986). Seedling# 80-131G. TB, 36" (91 cm), Early midseason bloom. 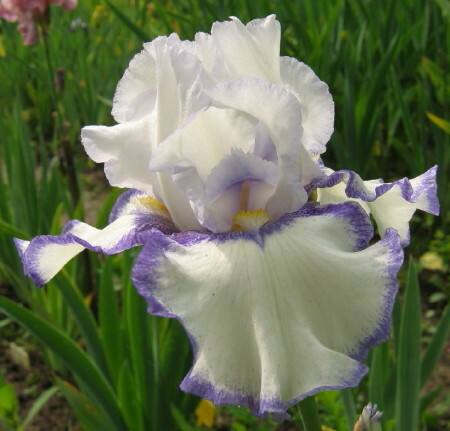 Standards white; falls white, columbine blue (M&P 42-G-10) hafts and precise 1/4" plicata edge; white beard, lemon yellow in throat; slight sweet fragrance. Seedling# 76-126A: ((('Vaudeville' sibling x 'Montage') x ('Vaudeville' x 'Charmed Circle')) x (('Montage' x ((('Gene Wild' x 'Majorette') x 'Rococo') x 'Vaudeville' sibling)) x 'Vaudeville' x 'Charmed Circle'))) X 'Charmed Life'. Keppel 1987. From AIS Bulletin #264 January 1987 Introducing SNOWBROOK (Keppel) EM 36" ((inv. Vaudeville and sibs, Montage, Charmed Circle, Gene Wild, Majorette, Rococo) X Charmed Life). Pure white, with columbine blue hafts and precise 1/4" plicata border on falls only. $35.00. Keith Keppel. JPG SnowbrookSI.JPG manage 223 K 17 Apr 2019 - 03:02 Main.TLaurin Photo by Sandy Ives. jpg snowbrook1.jpg manage 33 K 08 Dec 2018 - 03:53 Main.TLaurin Photo by Iriszkert Szasz-Hungary.